Staying true to Jean Marie Roy’s original 1964 design, Dan Hanganu & Côté Leahy Cardas Architects have given this voluminous monument of modernity a new lease of life in honor of renowned children’s author, Monique Corriveau. The conversion of a Church always a tricky one to gauge in relation to the surrounding community and the significance of modifying a religious building, especially a church as architecturally innovative and historically relevant to Quebec. However, the combination of preservation and transformation is executed with such taste, loyalty to the original design, and consideration of community benefits that the Monique Corriveau Library stands out as a reinterpretation that will continue Roy’s legacy and unusual design into the future. Erected in 1964, the St Denys du Plateau design was founded on simplicity, purity and harmony. Innovative in his use of space and volume, Roy transcended Gothic norms, anchoring the tent-like sails of his church with gently sloping flying buttresses, creating an open and welcoming arch. Glass walls between the descending beams created a visual relationship between the congregation and the community outside. Tossing aside traditional values of sanctity upheld by stone walls and stained glass, Roy’s design invited the outside in. How better to honor this inclusive design ethos than with a library that doubles as a community center?! Maintaining the original form of Roy’s church, Hanganu & the Cote team have built on the existing transparency and visual continuity. 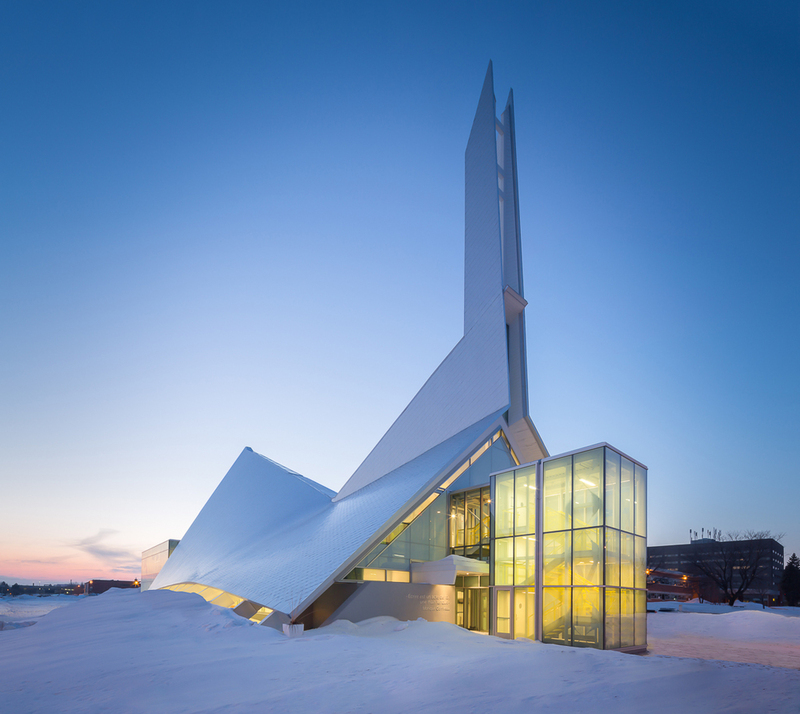 A glass expansion on either side effortlessly blends with the brilliant white exterior of the tented steeple, creating an illusion of the sails of a ship amongst shining ice glaciers, reflecting the light of the sun by day and twinkling from the electric inside by night. Inside, the attention to detail and use of space comes together in a clever, functional and aesthetically enticing design that is both soothing and exciting – an ideal environment for the reading, computing and study that takes. With instructions “Rever” (to dream) and “Decouvrir” (to discover) speaking from the walls, winding staircases connecting the floors and stacks of literature craning towards the peak of the arch, it seems that the voices and echoes of the church have been loyally incorporated into the layout and fluidity of the space. Smooth clean lines and a bold use of color with a keen consideration of the function and efficiency of a library make this a feat in both reinvention and original, creative design. It is safe to say that Roy’s unique architectural design has been both preserved and even further modernized. 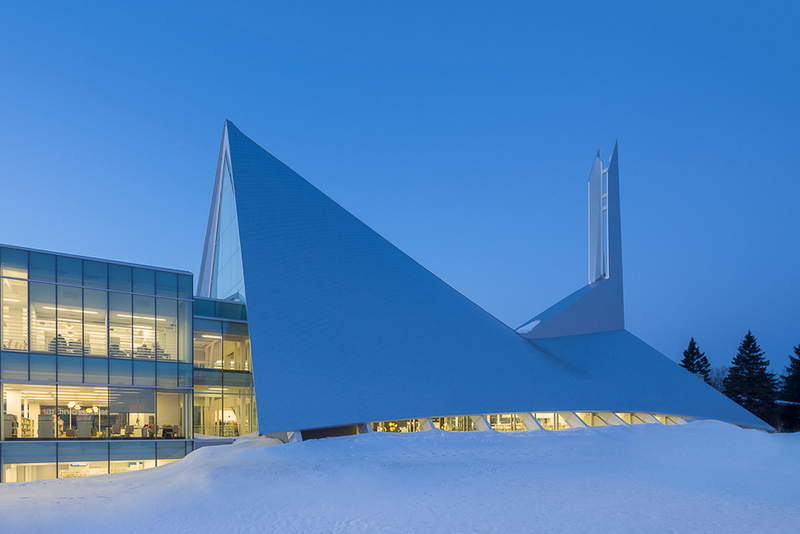 The Monique Corriveau continues to contribute to the community, successfully encompasses historical and contemporary design, and with appropriate levels of homage and sentimentality, keeps the St Denys du Plateau anchored by its vast beams to the place where it began.